After checking-in at our hotel we caught the park bus to the bus terminal. Near to the bus terminal is Disney Village (more about that in part 3), and then there are two parks. 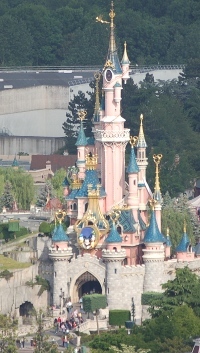 The traditional Disneyland Park (EuroDisney), and the Walt Disney Studios Park. Both are worth visiting, but we spent much more time in the Disneyland Park. If buying the tickets yourself (ours were in the hotel package) then go for the Park Hopper tickets that allow you to travel between the parks. Not all outlets sell these, if they aren’t Park Hopper tickets then I suggest you wait till you get to the park (or buy online before you travel). First we went into the Disneyland Park. There is a security bag check and then turnstiles to get into the park. There are doors between the turnstiles that staff open to allow pushchairs and the immediate family through. The park is great for kids of all ages (even really big ones!). The basis of the layout is similar to Disneyland in the USA, but it’s quite a bit smaller and it doesn’t have the same rides. Fantasyland For the younger children and young princesses. Featuring Sleeping Beauty’s Castle and It’s a Small World ride. Frontierland Wild west themed. From gentle boat rides to fast action rides. Featuring the Molly Brown steamer and the Thunder Mountain, Runaway Mine Train ride. Adventureland Exciting rides and thrills. The main attractions are the Pirates of the Caribbean ride and the Pirates’ Bay play area. Also has the Indiana Jones ride (unfortunately does not compare with the one at Disneyland LA) and the suspension bridge for the brave. Discoveryland Future and Sci-Fi themed area. Including Space Mountain Mission 2 and the Buzz Lightyear Laser Blast (great for kids). There is a train that goes between the different areas, but we found walking to be just as good. It’s still worth going for a ride around the park though. Kids will love meeting the characters. For the main characters then queueing is normally in place, but for some of the other characters they will just mingle with the visitors. They will sign autographs and pose for photos. There is an official photographer at some of the characters, but the prices were very expensive and you can click away with your own camera. The rides are great. Queues get long at busy times, but there is a Fastpass scheme for some of the more popular rides. Be aware that some of the FastPass tickets go very quickly (eg. Thunder Mountain) and you can’t hold more than one FastPass, so if you get one that is a long way ahead you can’t get another until that time. The best way to negotiate the FastPass queues is for just one person from the group to take all the park tickets to the machines. 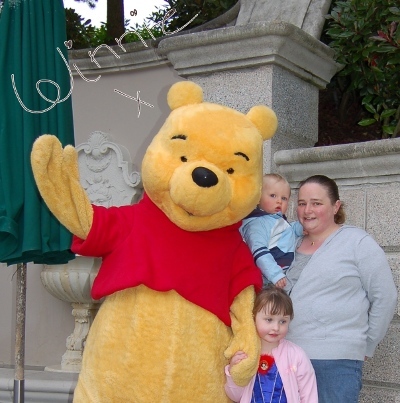 Some people queued for the fastpass with a pushchair which was very awkward when they had other people with them. There is also baby swap available on some rides. If you have a child that is smaller than the minimum height for the ride then you get a babyswap ticket for whoever is left holding the baby. They can then go on the ride straight after without having to join the long queue. This is a great idea, although we did not need to use it as we were on holiday with other family members. Lookout for the start time for the parades (leaflet at the start to Main St USA) and try to get there early if possible. People start lining the streets 30 minutes before, but 15 minutes is okay if you don’t mind being right at the front. There are some of the bad characters (“naughty people” as my daughter calls them), so some children may prefer to not be in the front row anyway. The Walt Disney Studios is themed along the lines of studio sets. There is a good mix of rides / events for adults (Hollywood Tower Hotel, Armageddon, stunt show) and those for young children (Lightning McQueen’s Cars ride and Aladdin’s Magic Carpet Ride). The Behind the Magic Studio Tram Tour is well worth a visit and is suitable for all ages. Be prepared for getting a little wet, especially those in the left most position of the tram. 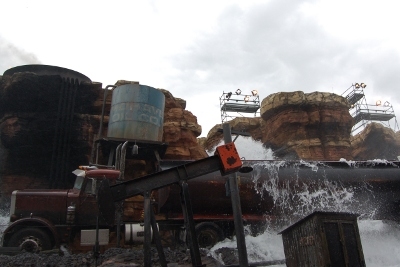 Unfortunately we experienced a lot of rides breaking down when we visited. It was very frustrating when it added to the already long queues, especially if you were turned away from the ride after waiting a long time. The following rides all had (or appeared to have) problems when we were there. Baby changing facilities are quite poor for a children’s theme park. The normal toilets did have somewhere to change a baby, but it was just a bench, either coated wood or even metal. There were no baby changing mats etc. The special baby suite wasn’t much better either. The wooden surface was a bit better shaped and they did have the giant paper roll, but there was no way soft. In the baby suite there was a queue to get to the baby changing area. Pushchairs (strollers) are very useful. Our daughter (age 3) does not use one anymore at home, but found one useful at Disneyland due to the amount of time spent walking / queuing etc. Pushchair hire is available, but the ones we saw were not suitable for babies or very young children. I’d only recommend them for toddlers and older. For lunch we ate at the restaurants in the park. We went to the cheaper fast-food style restaurants as we were eating in Disney Village in the evening (see part 3). These were expensive. The food was okay for older children although they had less choice than the adult meals. There was not much suitable for younger children at some of the restaurants, for instance the bread for the sandwiches was ciabatti which was too hard and dry for our son. We gave our son baby food for most of the lunchtime meals for this reason. Most restaurants had an accessible microwave (in Toad Hall it was behind the serving counter for some reason). The food in the adult meals is shown as set price meals, but is often the same price as buying the individual items, so if you didn’t want dessert (which were not that great) then there was no penalty for not getting one. Au Chalet de la Marionnette was one of our favourite restaurants. It was Pinocchio themed serving spit roasted chicken. We also enjoyed the fish and chips from Toad Hall and Fuente del Oro Restaurante (Tex Mex). For a little healthier food the Backlot Express Restaurant in Studios served sandwiches and Croque Monsiour. This entry was posted on Monday, June 8th, 2009 and is filed under Babies, Children, General, Holiday, Tourism. You can follow any responses to this entry through the RSS 2.0 feed. Both comments and pings are currently closed.